Very nice room, with kitchen. Aircond noisey, and only 3 lifts for 30 floors, means waiting at times. Breakfasts nice, but food wasn't kept hot. still a pretty new hotel. I wasn't given a room that has rabbit bunny decal in the room, so end up the room look very industrial to me instead of a cute room. The staff were amazing. Delicious buffet breakfast with lots of choice. 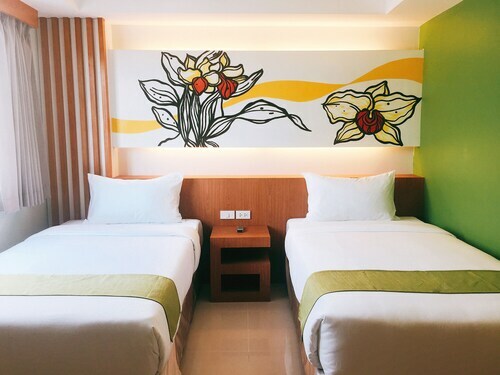 The stay is great and strategically located in Pratunam and walking distance near Ratchaprarop Airport Rail Line Station. In the middle of all shopping with Platinum, Big C, Central World, Famous Soi19 Wanton Mee, Pratunam surrounding it. Hotel is about 20 mins walk away from the shopping areas like pratunum and platinum, but it is fine with tuktuk service from hotel. I will come back if i visit pratunam again, i will also recommend to friends if they come to Pratunam area. 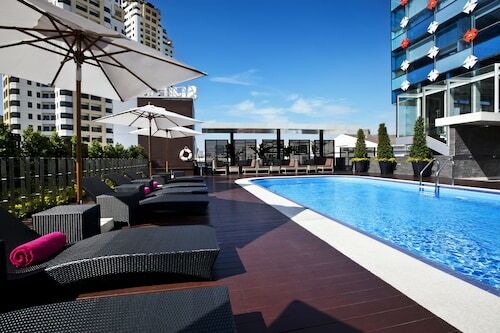 Set in the heart of Bangkok, adjacent to the Ratchaprasong commercial area, is the thriving Pratunam neighbourhood. 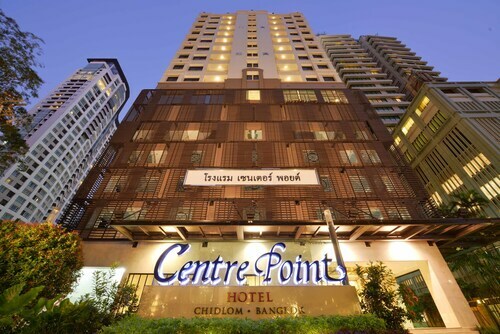 It is considered part of Bangkok’s downtown core, and boasts a perpetual market atmosphere. Bargain shopping is one of the main highlights in this interesting district. Pratunam is also famous for its local cuisine, which is culturally unique as much as it is delicious. Tourists will find a number of fascinating landmarks and entertaining things to do when visiting Pratunam. The tallest structures in the city of Bangkok are located inside this bustling district. The Baiyoke 2 Tower is a soaring skyscraper that can be seen from almost anywhere in Bangkok. It also provides tourists with a fantastic dining option which has unmatched views of the sprawling city surrounding it. Next to Baiyoke 2 is the original Baiyoke Tower. It is shorter and less impressive, but still offers great views from the top-floor restaurant. Just a short walk from Pratunam is Central World, which provides children with some exciting play areas, not to mention a small ice-rink eight months of the year. In addition, the SFX cinemas offer the latest Hollywood blockbusters, so visitors can enjoy a movie in style and comfort. In Central World’s courtyard is the Ganesha shrine, which welcomes hundreds of worshippers each day. Trimurti Shrine is also located next to Ganesha. These two shrines are among Bangkok’s most important non-Buddhist relics. Pratunam boasts a large range of dining options for visitors. The malls contain the usual fare – international food chains like KFC, McDonalds and Burger King. However, some local delicacies can be found along Petchaburi Road, including popular khao maan gai, pad Thai and more traditional som tam delights. In addition, some of the hotels in the Pratunam district have a more upscale dining option with various international cuisines on offer. There are some laid-back bars found here, but Pratunam is not a highly recognised night spot. For some of the best bargains in Bangkok, tourists should spend a few hours strolling through Pratunam’s many shopping facilities. 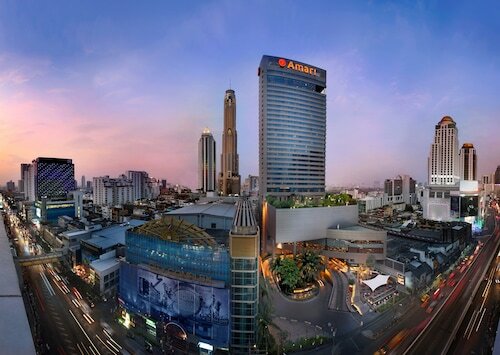 For electronic goods, Pantip Plaza is a renowned spot to visit. Beware though, because prices of merchandise tend to be cheap, but the goods aren’t always top quality. Platinum Mall, and Palladium Mall rest on opposite sides of the intersection, and a remarkable market operates on most days, from morning to night.